Advice for first-time or seasoned travelers! The website Anglotopia.net is a wonderful resource for information on all things British. There are news headlines, forums, entertainment and wonderful travel advice. Now, the most useful travel advice about London has been gathered into a downloadable book called 101 London Travel Tips. The book is divided into extremely useful sections covering such topics as Travel Planning & Advice, Lodging, Food and Health & Safety. Jonathan Thomas and his wife Jackie, who wrote the guide together, do a wonderful job of providing advice that will be useful to both the first-time visitor to London, as well as tips that will enhance a repeat visit. A very useful aspect of the guide is that it is written by Americans, so there is a lot of information about what might be unexpected or different for American visitors. I especially appreciated the advice on how to order in pubs and how to deal with tipping! There's also a great section with an explanation of common British slang which will be invaluable to those of us on this side of the pond who travel to London with the sometimes mistaken belief that we speak the same language! 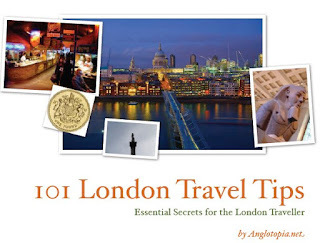 Although the title is 101 London Travel Tips, there are actually many more tips included. Many of the tips consist of lists such as "6 Fun Things to do in London at Night," "The Top 5 iPhone Apps," "5 Must See London Shows" and so on. Anyone who loves London will greatly enjoy reading this guide! Not only can you come up with some great ideas for your next trip, but you can also benefit from the experience of someone who has a great fondness for his subject! 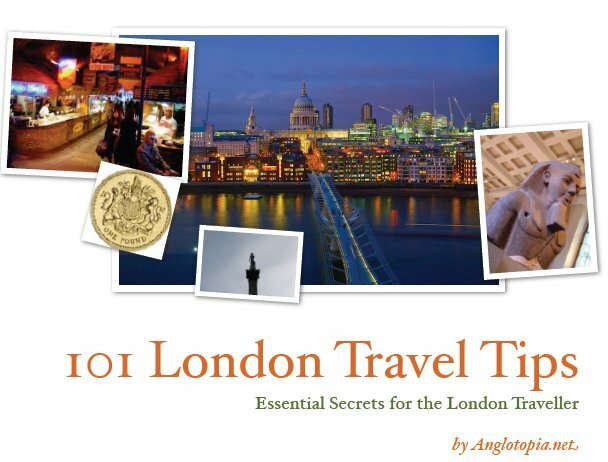 You can download a copy of 101 London Travel Tips for only $10 at Anglotopia.net. While you're there, be sure and browse the site. You'll be amazed at all the information to be found there! Final Verdict for 100 London Travel Tips: Five Gherkins, for being a wonderful guide for London travellers! Top tip:- I spent a day in London recently and did the tour. Apart from lunch and some biscuit souvenirs, it only cost me £5:60 for a zone 1 and 2 tube pass, check out my humorous blog to catch up with what I got for my money !! Great photos on your blog! Glad you were able to fit in so much while you were there!